Sephardic Jews, descendants of those expelled from the Spanish territory in 1942, have it really easy to get the Spanish passport nowadays. Are you considering applying for the Sephardic Nationality in Spain? If yes, you will have many doubts. What should you consider? In this post, we are addressing the main steps you will need to take in order to get your residence permit. VIDEO INCLUDED! This year has been a successful one. More than 50 individuals have obtained their passport with our help. And the Sephardic Passport has been one of the most demanded services. We have just signed another Sephardic nationality at our offices, and we are really happy. Helping our clients move to Spain is what fulfils us the most. And we want to keep doing it with all the other Sephardic Jews who want to move to our country and get their certificate. But, which are the main obstacles they face when going through this process? 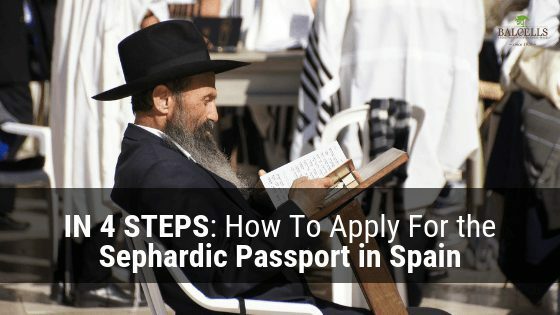 If you want to get the Spanish nationality as a Sephardic Jew, you will need to go through a process that can seem a bit tedious sometimes. There is some paperwork to do, but we are here to help you. Which are the required steps you will need to take in order to get your Sephardic certificate? The first steep is proving your Sephardic condition. What does that mean? That you need to demonstrate that you are originally shepherd, a descendant from those expelled from Spain in 1942. The question is, how can you prove it? You need a document emitted by the Spanish Jewish Federation, confirming your Sephardic origin. After you have submitted those documents that prove that origin (like the birth certificate, grandparents certificate, certificates from the synagogue, surname connection, etc. ), they will check them and send you back a letter certifying that you are originally Sephardic. The second step may require you to study a bit. The DLA 2 Spanish basic exam. If you are a resident from a country in which they speak Spanish, you don’t need to do this exam. The CSE, the cultural one, which is mandatory independently of your nationality. The exams take place during 5 different times a year. At Balcells Group, we will manage for you the signup process for each exam, selecting the date that better suits you. Afterwards, we need to process the criminal records background from your country of origin and country of residence. Both documents must have an apostille or must be legalized in the case there is no apostille. Furthermore, the birth certificate of the country you were born is also needed, again with apostil or legalized if there is no apostil in this country. Finally, you should work on the links with the country, Spain. How can you prove it? Registering or becoming part of any public or private institution in Spain. For example, you can register in a Spanish speaking library, open a bank account, or become a member of a club. Here, in our office, we can crate a certification for you showing that you are client of an Spanish law firm, which would also work. Either way, coming to our office would be the suggested solution, so we can discuss together which is the best option for you. HURRY UP, YOU DON’T HAVE A LOT OF TIME! If you want to apply for the Sephardic Spanish nationality… you need to hurry up. The Government extended until the 1st of October of 2019 the possibility to conduct the whole process, but you cannot wait until the last day, as the procedure requires time and some effort. Do you want to start NOW and get your nationality in Spain AS FAST AS POSSIBLE? Then let us help you. Let us be in charge of the whole applicaiton process for the Spanish nationality, obtaining the documentation for you in a record time. Hello My name is Haim Cohen 53 years old i am living with my family in spain valencia total of 7 years in spain (my birth is tel aviv israel) i have british passport too that i was living in uk for 24 years , i do understand that you can get spanish passport to jewish sephardic by spanish law , i am knowing for 100% my family mum and father generation are a Sephardic Jewish my father surname cohen my mother family name Soria . i have some documents it my help to get prove all . Please if you can help contact me any time. If that is the case, we can help you get your Sephardic passport. We will contact you as soon as possible. What is your fee for helping me apply for this? We charge 1000€ for managing the entire procedure for you.